Jeffrey Fisher argued on behalf of the child, known in the litigation as Drew, and his parents, who withdrew their son from public school and enrolled him in a private school after his individualized education program (IEP) proposed goals for fifth grade that closely resembled goals for earlier years. 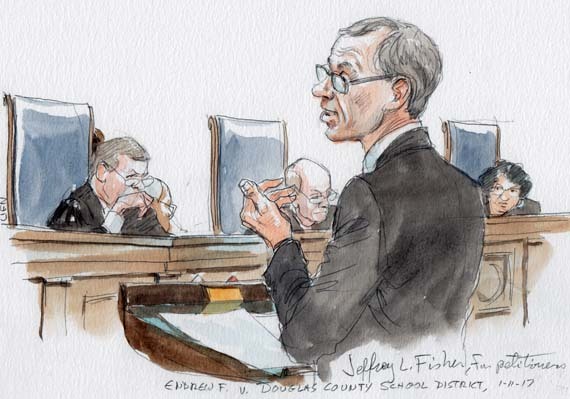 Fisher told the justices that the federal Individuals with Disabilities Education Act required the school district to offer Drew a program that is “reasonably calculated to provide” him with educational opportunities that are “substantially equal” to those offered to other students. Such a standard, Fisher assured the justices, follows directly from the text of the IDEA. But despite Fisher’s efforts to focus the justices on the text of the statute, they remained skeptical. Justice Anthony Kennedy expressed concern about what new costs Fisher’s proposed standard might impose on school districts, by requiring them to provide additional services, while Justice Stephen Breyer worried aloud about the propriety of the justices – who, he suggested, “don’t know much about” education – creating a standard that could then be interpreted differently by “judges and lawyers and people” all over the country. 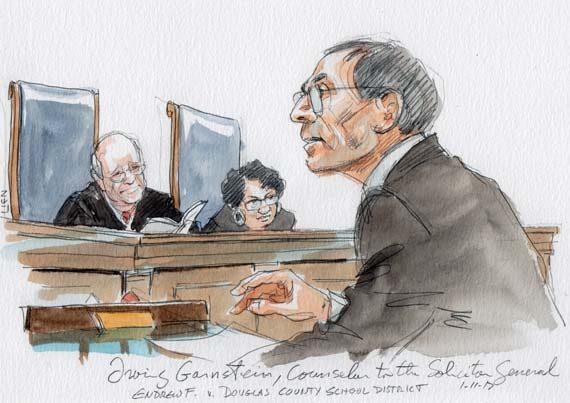 Justice Sonia Sotomayor seemed to summarize the dilemma facing the court neatly, telling Gornstein that “I do think the” IDEA “provides enough to set a clear standard.” But the problem, she continued, is trying to come up with the right words, which will “be less confusing to everyone.” Roberts also pressed Gornstein on this point, telling him that “maybe you have a lot of different adjectives to describe the standard,” but “there’s really nothing concrete there” for courts to review. Breyer seemed to agree with Roberts. Even if the phrase “some benefit” is “ambiguous,” he posited, the IDEA has been amended. When you look at the requirements for an IEP, he observed, “you do see in at least two and maybe more places that the IEP is designed” to allow the child to “make progress in the general education.” The combination of “some benefit” and “make progress,” he concluded, results in a more stringent standard than “more than merely de minimis,” much along the lines of what the federal government has proposed. 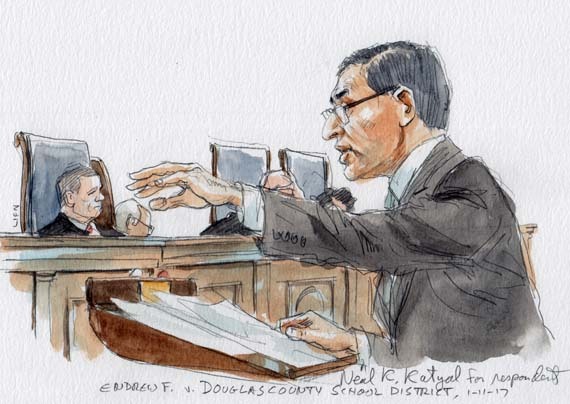 Katyal appeared to get a little more traction from his repeated reminders that the “more than merely de minimis” standard has been in place, and has worked, for many years, without the courts actually applying “some really low standard.” To require a new standard now, he suggested, would “invite massive amounts of litigation” that would create a “huge morass” for “federal generalist courts.” But some justices were still dubious about the provenance of the “more than merely de minimis” standard, hinting that the standard has no basis in the court’s precedent and was (as Ginsburg put it) instead “invented” – which could make it easier for the justices to replace it with a more stringent standard (like the government’s) that they regard as based on the text of the IDEA.